Having asian lashes can sometimes be frustrating. They tend to point downwards, are short, thin, wispy and quite frankly, not the best. This means I am forever on a hunt for the best mascara. What do I look for in a mascara? First of all, it needs to give my petty lashes some volume and length whilst holding a curl, not asking for much eh? I got this Guerlain Cils D'Enfer Maxi Lash* mascara last week. Labelled as a luxury curl sculpting mascara, allowing you to layer on the product to create different effects. Retailed at £22, I found it quite reasonable when compared to other high ends mascara's. First of all, the packaging is so glamourous and luxury looking, maybe all mascara's need to look like this? Second of all, lets talk about it's performance. The wand is made up of dense bristles which feels lovely when brushed along my lashes. I began by curling my lashes, I ALWAYS curl my lashes so it made sense that I did to understand the mascara's true potential. I started with one coat, wiggling the brush back and forth, it gave my lashes a very natural effect, perfect for those who dislike the spider lash effect and luckily, may already have long lashes to begin with. Obviously I need more volume and length, so on goes a second coat. As you can tell, the results were significantly different. My lashes were looking longer and more voluminous, it also held my curl pretty well, no droopy lashes here. Overall I really like this mascara, it did everything I expected it to do. I especially like my bottom lashes which look ALOT fuller and longer. Also, did I mention this product smells amazing?! Pretty rare, as most mascara's tend to have that wax like smell, this mascara smells almost like a skincare product, maybe like a hand or face cream? I likey. 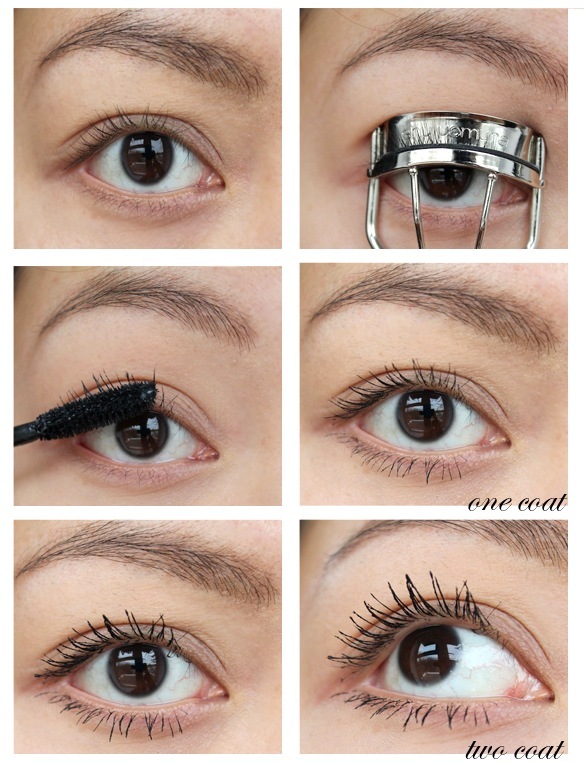 did you test Lancome Dolls Eyes Mascara?? Brush looks amazing on this! You should try Giorgio Armani Eyes to Kill Stretch Lengthening- the one in the gold-ish tube - does wonders for my short asian lashes. Gorgeous packaging and it looks amazing with two coats! does it smug easily though? I love Guerlain Maxi lash mascara, it just so fragranced! And the packaging does look good but it feels cheap in my hand.